RICCIARELLI di Siena | Just Visit Siena ! RICCIARELLI wherever you are ! Going back to yesterday’s subject . . . by the courtesy of Giulia Scarpaleggia (http://en.julskitchen.com/) you can get the original recipe for RICCIARELLI and enjoy their unique taste. The link to recipe you can find below . . . So one more time . . . buon appetito! Why not, it’s not a secret that everybody loves sweets. And that every Italian loves to eat. So you should learn (here it means to taste, because how to learn without tasting) what is it RICCIARELLI di Siena. As you can guess it has to be traditional Italian sweet. True, RICCIARELLI is a biscuit with origin in the Tuscan city of Siena dating to the 14th century. According to legend they were introduced by Ricciardetto della Gherardesca in his castle near Volterra. But let’s come back to the present and our reality! What’s the recipe? And here lucky me! My favorite almond is a main ingredient. Thus the unique biscuits are made using an almond base with sugar, honey and egg white. Traditionally almonds are ground with a milling machine. After this they are formed into mostly oval-shaped cookies, and then are left for 2 days to be baked. Their surface is usually lightly sprinkled with confectioner’s sugar. Yes they are sweet, but I can guarantee you that one biscuit will be not enough for you. Only their price (small box costs about 6EUR) or calories (about 500 kcal per 100 gr) can stop you but maybe it will be not a big deal for you. The best for sure is a soft heart of RICCIARELLI that melts in your mouth. Welcome to the seventh heaven! When is the best time for RICCIARELLI? Formally it is Christmas . . . but if you are here you will notice that their best time is ALWAYS. You ascertain that here in Siena you will find them easily, mostly in pasticceria (confectionery ). 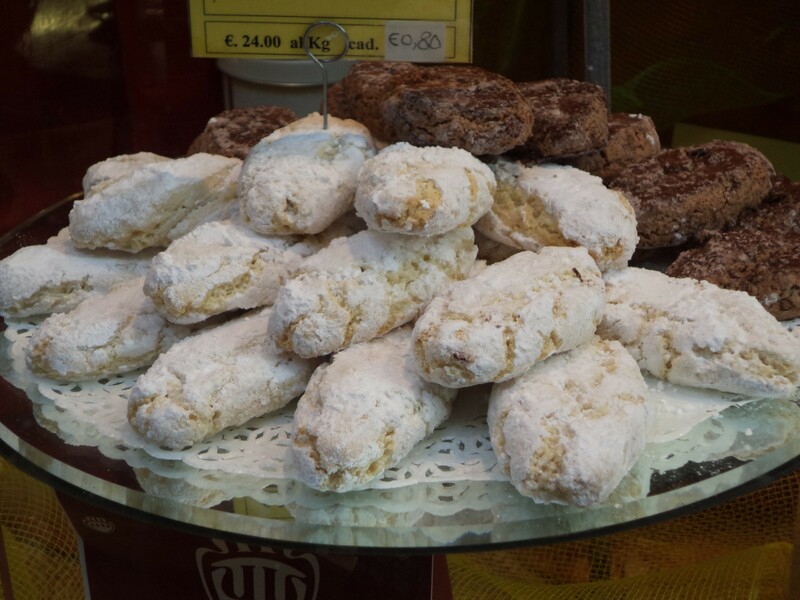 So what do you think about RICCIARELLI and a glass of wine? I highly recommend! So let me eat mine . . . and enjoy my moment of forgetfulness . . . buon appetito!